I spent most of this week undertaking a fairly crazy schedule of airline-related events under the general heading of ‘Star MegaDO’. This was three days of activities organised by a US frequent flyer group and involved a trip to the SAS HQ in Stockholm, a visit to the Airbus factory in Toulouse and a tour of Terminal 2 at Heathrow. All within three days. I will be running various articles on aspects of this trip over the next week – except, sadly, for the Airbus factory tour where photography was banned. The final event was a tour of the Singapore Airlines A380 (official page here). They have an aircraft sitting on the ground in London for six hours every afternoon so it was a great opportunity to get inside the aircraft without any of those irritating passengers in the way! Whilst the cleaners were still inside, the chief engineer came up to the gate and gave us a talk about the aircraft. I never knew, for instance, that British Airways provides all of the technical support to Singapore Airlines in London and were maintaining their A380 fleet before BA even had their own! I DID get to sit in the pilots seat and I did get to visit the crew rest area where up to 12 crew members can sleep at any one time. Unfortunately, photography was banned here – sorry. I did take a shot out of the cockpit window though. Unusually, the First Class Suites are downstairs, along with economy. It was therefore easy to pop into the cockpit and test out the pilots seat. 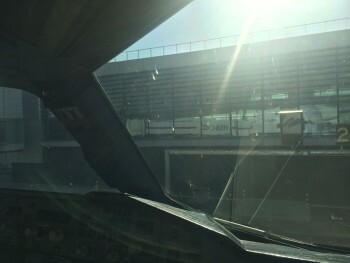 Whilst I cannot show you that, here is a view from the cockpit window! 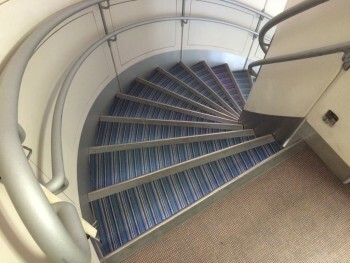 I then headed upstairs into business class. 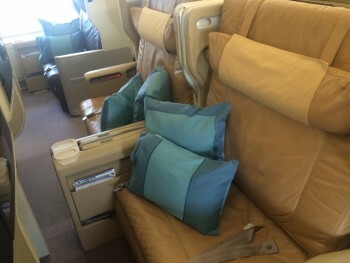 Singapore Airlines has, on the A380 and Boeing 777 fleet, the widest business class seat in the world. I am flying this next Friday, as it happens. The seats are so wide that my 4-year old could sleep sideways …..
To be honest, I have a problem with the Singapore Airlines colour scheme. 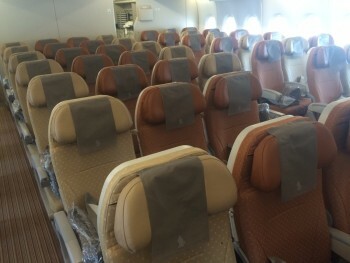 First Class / Suites Class and Business Class are effectively different shades on brown and not hugely appealing, but that is purely down to personal choice. Whilst the seats are wide at the top, they are not so wide when made into a bed. Your feet need to slot into a small area as you can see below. What differentiates the Singapore seat from most others is that it FLIPS OVER into a bed. The seat itself is leather but the back is fabric. This means that you get a comfortable leather seat but you are sleeping on breathable fabric. I then headed downstairs …. …. into economy. I have a confession to make. As far as I can remember, this is the first time in 15 years that I have actually sat in an economy class long-haul seat! It is the standard 10 across configuration. Whilst economy is economy is economy, Singapore is very proud of the quality of its food and the level of service it provides. They still provide paper menus, for example. The economy cabin on the A380 is also broken up into three sections which means that you don’t feel overwhelmed by a sea of heads. Singapore Airlines is about to launch a new premium economy product for the first time. The first A380 is currently being refitted and it will start to roll out later in 2015. I will be writing a full report of my Singapore Airlines business class experience in a couple of weeks so keep an eye out for it. 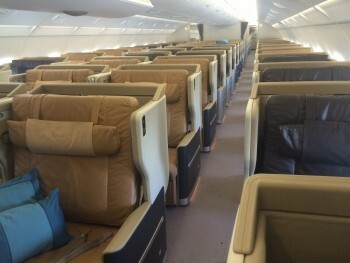 In the meantime, you can see my report of my A380 First Class / Suites Class flight here. Coming on Monday - win an Apple Watch AND 50,000 Virgin Flying Club miles! 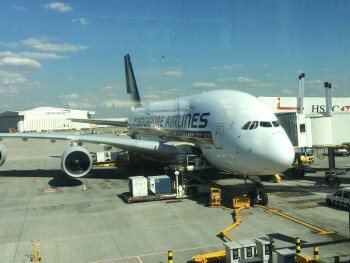 The A380 is such a beautiful aircraft to fly on, and Singapore have done a great job getting the best out of theirs. Agreed. Singapores a380 was the first one I flew soon after its introduction: I got lucky with two speculative redemptions when it was still 744s, later switched. A long period then elapsed before SQ released J seats for partner rewars. I am surprised Rob disliked the colour scheme, I thought it was relaxing and in conjunction with low density in J, it made for great cabin ambiance. However, what I do dislike is the J seat itself; imo the worst full flat J seat I have flown. Due to the extreme width and the diagonal sleeping pattern the width to pitch ratio just felt so weird. The seat also lacks support, with its flat base and ribbed back it lacked ergonomics and more resembled a booth seat in a fast food restaurant. I have to say I thought the wide, square design of the seats made them look uncomfortable. I’d need several cushions to sit in one. That was my experinence, I had to use pillows and blankets to stop me sliding across the seat. Rob, yesterday I booked a round trip to BKK in economy on Etihad out of Edinburgh. I think it is at least 10 years since I last flew longhaul Y. Using the 30% off promotion I could have got a great fare in J, especially exEurope. However, I decided to try this for a number of reasons; a sort of mileage run experiment. Firstly, after discount, fare was only £316 return. I paid with new Etihad credit card so should be elevated to silver after this one flight. It is E fare class so earns 50% miles but I registered for both double miles for new route within 30 days and triple miles in economy so I am curious to see how Etihad will stack these up. It seems Etihad has multiple routes to upgrade: miles, auction, and cash either predeparture or at the gate. I am curious to test if I can make those work to my advantage, particularly on the longer EDI/AUH sector where I think they will find it quite difficult to achievd heavy loads on J through revenue tickets. I will report back on how it goes. Thanks. They had a sign up pushing last minute miles upgrades when I was in Abu Dhabi. From EDI you would be liable for another £100 of APD – not sure if this makes it too cumbersome to offer. It is a morning departure from EDI so will just see how that is in Y unless something comes along I cannot refuse. AUH to BKK is about 30k miles to upgrade so may try to get that once in AUH using my cc signup miles and 3000 spg points in the hope I recoup them from stacking bonus miles. Coming back I will see what I can do with cash and the auction. That’s a nice price, what dates was that for James? 30% off code for Tuesdays (flytues11) or Wednesdays (flywed01) in conjunction with breaking deals promotion fares. Seems to be any class, anytime, anywhere as far as I can see. Fantastic deals ex AMS in J. If you book anything renember to register first for 3x miles in Y and 4x miles in J. You can also register for double miles for first 30 days on new routes. Is getting into the cockpit, on flights, still difficult, obviously not during a flight? Pretty surprised at the time though, as I thought JFK would be the last place to be able to do that. We have a BA flight log for my son, and from experience of BA shorthaul flights and some package holiday flights, handing it in often results in an invite to the cockpit. Coming back from Munich last month, the captain invited my son in and asked him to press some buttons that started the APU! He then was invited back at the end of the flight to say goodbye to everyone over the PA! Pilots love showing off their office to kids, and dads! We did hand the flight log in to be signed busy the captain, that would explain it. Where can I find a logbook? I got ours on the flight a few years ago; just ask the cabin crew. I recall someone on Flyertalk mentioning that they’re not on all flights; ours was to Prague. 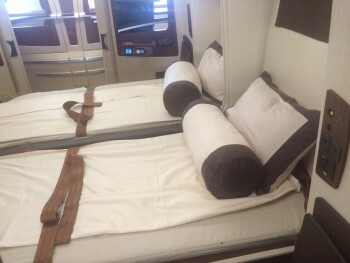 I booked F on an Etihad a380 after raffles post about only needing 75% of the miles, they have since changed the aircraft to a 777 and I am stuck with it! Unless I missread the rules, your first changebis free of charge so always an option if seat becomes available. What dates did you book? It may be because they are starting an A380 service to NYC on 1 Dec.
My favourite airline! I believe they provide the best overall product for the three classes in this plane. I am actually flying SQ in F next Friday as well from LHR. Can’t wait! Do you know if there’d be an opportunity to visit the A380 another time during its 6 hour layover? Would be fascinating to see it without passengers. I am the guy in the lounge with a boy and a girl and a woman who looks too young to be his wife (because she isn’t!) …..
Out of curiosity, does that mean you never fly the budget airliners? I never used to, but practicality kicked in, so I set a limit: any flight less than 2 hours, I’ll be prepared to use them. For long-haul, I’m actually prepared to go out of my way to get a better flight there, yet for most of Europe I wouldn’t even consider it now. I only live 25 minutes from Stansted, so to go somewhere like San Sebastian means I can be there in via Ryan Air in a very short space of time. Compared to BA, I need to go to Heathrow, then get on a plane to Bilbao, then get in a car and travel for over an hour when I arrive. ‘economy long-haul seat’ was the phrase I used! We used to use Ryanair quite a bit when they flew to Lubeck in Germany because it was nearer my wifes parents than Hamburg. They then dropped the route so we went back to BA. I am perfectly OK with low cost airlines but the bottom line is that Heathrow is 35 minutes in a taxi from where I live and, as a BA Gold, I can force Avios seats open for redemption. As a family of four, 2×2 in Club Europe is actually practical as opposed to 3 + 1. I’m in Cambridge too. 12-18 months ago, I would have been the same, but some family arrangements in Ireland meant I had no choice but to use RyanAir last year (for the first time) and they were nowhere near as bad as I thought. Just be prepared to have people constantly trying to sell you scratch cards. 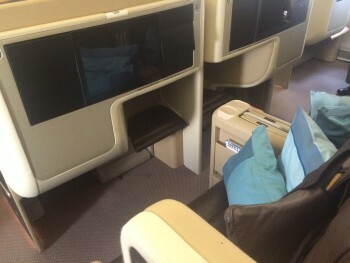 There’s a different configuration on SQ317 and SQ322 where they have upper deck economy on their A380. I’m curious why Airbus would invite you to an event but would ban photography which has meant that you won’t be writing an article, so it doesn’t really have any PR value for them? I can only think that it wouldn’t impact on print journalists that wouldn’t have been taking photos anyway. It was not a press event. It was a frequent flyers event to which some press were invited. Everyone was subject to the ‘no photos’ rule. Presumably you were on the Airbus factory tour that’s also open to the public? The Boeing factory tour is the same – we had to leave anything electronic in a locker before getting on the bus from the museum into the factory grounds. Boeing’s facility is immensely big – looking down from a gantry and seeing a line of 748s inside a factory is just amazing, would love to go and see Airbus too for comparison. No, this was a private tour. We went inside the A380 which is stripped down to the bare wiring and used for flight testing. It would be even more amazing if we could see them outside a departure gate! It is heartbreaking to see the demise of the beautiful 747, concorde long gone, and now the a380 supposedly at risk too. In a world of fast progress I cannot help but feel that when it comes to aircraft we are going backwards despite composites and more efficient engines. I’m tired of spending 10 hours on a plane to travel 5000 miles, I’ve been doing that for over 30 years. It’s time both manufacturers and carriers addressed the real issues in air travel. Well to be fair he does say long-haul seat! Obviously there is no difference in the CE and economy seat itself – apart from the extra legroom you get in the short-haul economy exit rows. Just looking at the pictures made me feel pampered . Just watched the emirates A380 take off and I wished I was on it. however, reality check… Currently in the BA lounge a Gatwick crowded and could do with a makeover. Oh well, it was a RFS ticket! Have you seen this great video ad from Emirates Raffles? Posted from Lucky’s One Mile at a Time site. Nice little dig at the Western (US) carriers. Btw my Etihad Gold status match randomly came through via email last week. About 2 months after I submitted the request. Better late than never. Love the SQ A380. Best experience yet was having the entire Suites cabin to myself on a SIN-AKL flight – had one seat to sit in then a separate double bed to sleep in, not to mention three cabin crew and two bottles of champagne opened for me (couldn’t decide on Dom vs Krug!) – amazing value with Amex MR points too!